By a conservative estimate, I have at least 126 more hours of packing to do before the moving truck arrives tomorrow morning. So why am I sitting here writing a blog? However. Since I'm already here and since I've already decided that the packing will never, ever get done--not in this life nor in the life to come--I figure I might as well just go ahead and ignore it. In fact that has become my new Life Philosophy, "If Ya Don't Like It, Ignore It!" When they had gotten it all finished, I had to smile (and shed a tear) when I walked down the hall and happened upon this box. 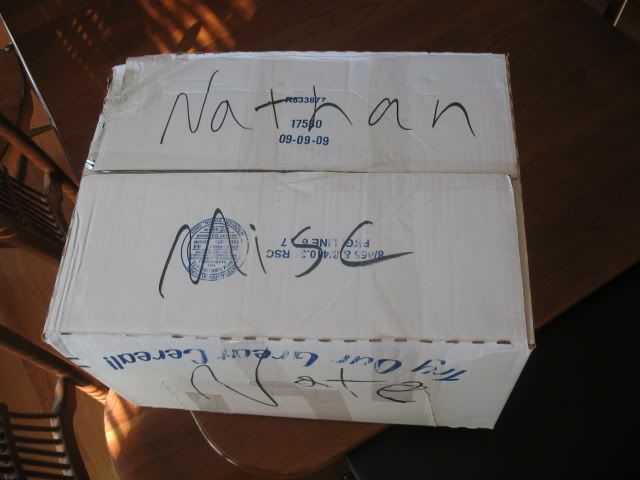 And then when I saw this box, I smiled even bigger because I realized that Nathan and Meagan had made the important discovery that at some point in the packing journey, there comes a time when you run across a bunch of stuff that doesn't fit into any category, any box, or any special spot. Therefore, it is very important to establish the all important "miscellaneous" category. If you don't, you will go absolutely stark raving mad. Which I've already done. So it's too late for me. But maybe I can save someone else from the same fate. 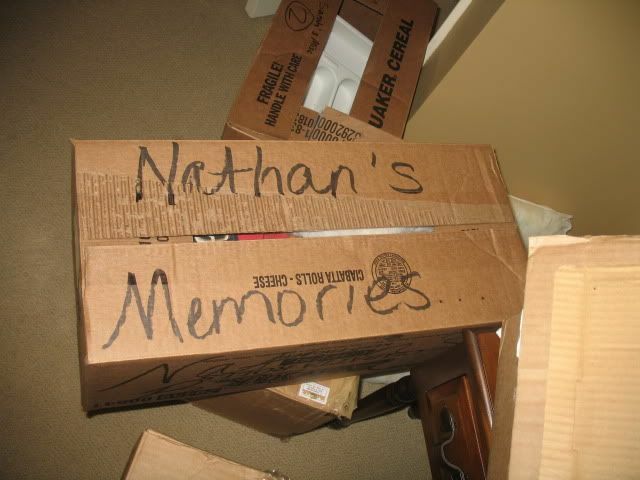 Eventually, between the miscellaneous and the memories, Nathan's room got packed. 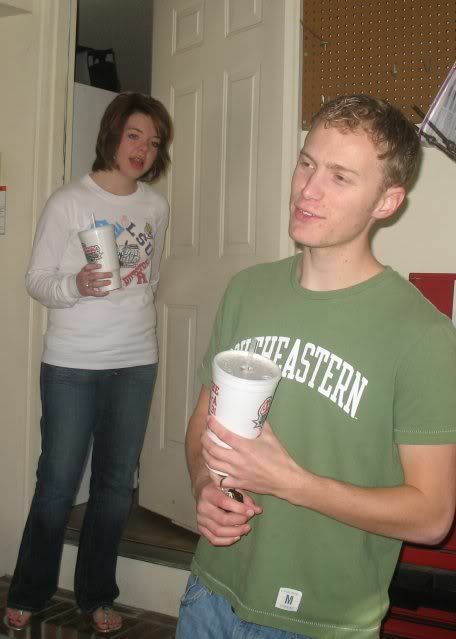 And eventually, the time came him for him and Meagan to leave this house for the very last time. Ever. Since I don't have any words in my awesome adjective arsenal to describe the feelings that were engendered by that particular event, I'll let my pictures say the thousand words for me. 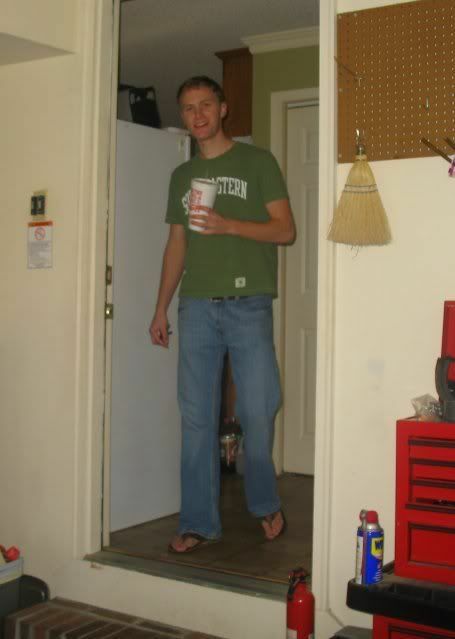 Nathan leaving the kitchen and walking into the garage. For the last time. Meagan joining him in the garage. For the last time. Smithfield hugs ensuing. For the last time. And yet even more Smithfield hugs ensuing. For the last time. 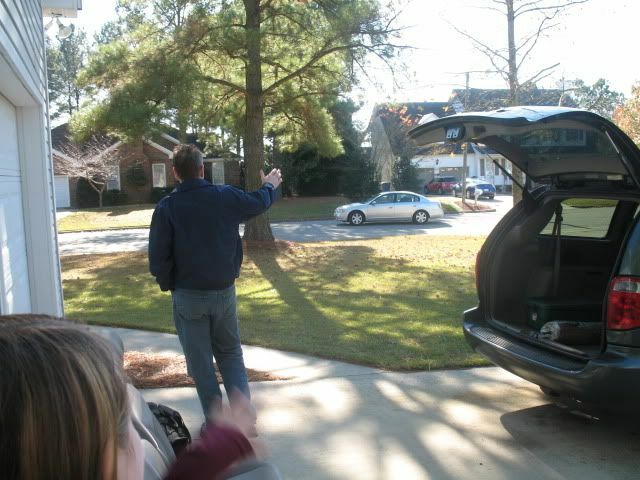 Waving good-bye as Nathan and Meagan pulled away from our house. For the last time. My child has left the house of his growing up years behind. And in the wake of his leaving, my heart is filled with the bittersweet melody of the miscellaneous and the memories. His wife was pretty upset with him! For me a house is a container and you take your memories with you. You can do it, Becky! You can do it. Moving is hard work, and you deserve lots of chocolate to keep you going. 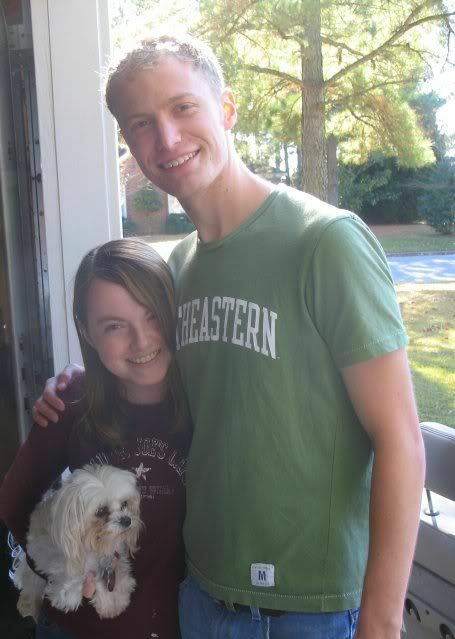 I know you will love your new home in Manteo, and it will be wonderful to BE there and not be on the road so much. Moving is so hard! I remember the day before I had to be out of my condo (when Mr K and I got marreid). It seemed like I could never possbily get it all packed and moved. Somehow I made it and I'm sure you will too. So excited for you. I love the outer banks!! We've been in our house 21 years. Yes, my kids have grown up there. Lots of living has taken place in this house....but, I wouldn't mind moving at all!!!! Great time to clean out, sort through stuff. I really think home is where we are and where the children come home to. I understand completely all the emotions, tears, fears and exhaustion because of your move. I have felt them all once before. It was horrible. I thank God you have a loving family around you as you travel this bumpy road of leaving your home full of memories and arrive safe and sound at the new spot for new memories and many new chapters. I hope and pray that you are on your way or in Manteo by now and the grief of leaving has been replaced with the sense of setting up anew and looking forward to some day reflecting on what was so difficult and realizing it was the best thing that happened. Remember all the pain and tears when Nathan left and you have since learned the rewards for that new chapter and transition. It is real, it is okay but you will find you are happier in your new home than your last - I am confident in that statement. Have FUN!!!! P.S. Guys just DON'T GET IT about our attachment and sentimentality to a house - I know that for a fact. And we're not even moving! And Nathan isn't even my son! Good luck with your remaining packing...I'm sure the move will be very exciting for all! sure hope your final packing really is/was final so you won't have to return to retrieve more. Your post today brought back so many moving memories for me. It does hurt to leave the places where memories are made doesn't it? Praying everything goes smoothly and you are damage free when you unpack boxes! !